We specialise in the transfer of Rands out of South Africa. You upload FICA docs and sign account opening forms online. You transfer Rands into your secure forex holding account. We execute the deal to move the funds to your offshore bank account. 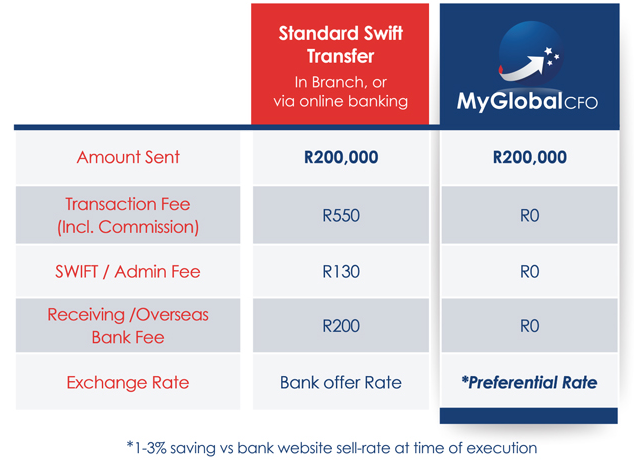 Free tax clearance application on transfers above R1m. Minimum FX transfer amount is R30,000. © MyGlobalCFO. All Rights Reserved.